Pizza ovens are traditionally a bit bulky and take up a lot of space in your outdoor area, where they have to live all year round. However, the Igneus Minimo has the capability of not only being able to cook almost anything but also being fully portable. It weighs just 15kg (firebrick included), which is a third of its cousin, the Igneus Classico. You would have no trouble at all popping it in the boot of the car and taking it on a camping trip or round to a friend’s summer barbecue. Remove the firebricks, and it will only take one person to transport. The inside of this particular pizza oven measures 30x40cm, meaning it is plenty big enough to cook a 12” traditional stone-baked pizza in only 80 seconds. There is also loads of room to be able to hold a square roasting tin and prepare any other al Forno dish such as bread, pasta and casseroles, or even the meat for your Sunday roast. To assemble, all you have to do is slot the chimney into the main body of the oven and place the firebricks inside. It runs on small 6” pieces of kiln-dried wood (ideally silver birch), which will give your food the perfect smoky, fresh-baked flavour. With a 316-stainless steel and matte black powdered aluminium finish, it will not only fit into any garden perfectly but will also be a real focal point. It only takes 15 minutes to heat up to the maximum temperature of 500°C, so last-minute garden parties are completely plausible. 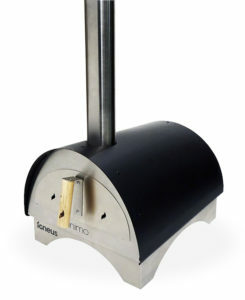 The Pizza Oven Shop includes a dedicated pizza peel and an embers rake with every purchase of the Minimo, as well as a 1-year guarantee. All you need is a heat-proof table or specially designed pizza oven stand and you are ready to go. 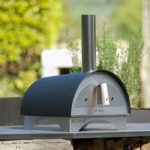 It is perfect for anyone who wants the authentic pizzeria experience in the comfort of their own home but wants to save space and doesn’t want to fork out the hundreds (or possibly thousands) of pounds that a pizza oven usually costs. Not only will the Igneus Minimo add a touch of the Mediterranean to your outdoor entertaining space, but it will also become your best friend no matter what you are having for dinner. Grab one quick though, as they are incredibly popular and in demand and you don’t want to be disappointed.